May 20, 2010 – It could use a little color, was the sentiment conveyed to educational technician Windell Hall in an e-mail back in January 2009 by an executive assistant to Jalen Rose. Former professional basketball player turned sports commentator Jalen Rose, a graduate of Southwestern High School, came to that conclusion after doing an interview in the Jalen Rose Resource Lab for BET News this past summer. That avalanched into an enormous effort by Jalen Rose Charitable Fund, University of Michigan-Ann Arbor’s Greek Life Society, muralist Chazz Miller, Southwestern alumni and current students at Southwestern High School to bring color to the room. Miller, famous for numerous murals done with the Motor City Blight-Busters, came up with the concept. Miller loved the help all the volunteers gave painting the 10-foot Prospector and 12- by-24-foot mural. 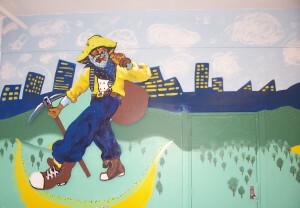 “A new mural depicting a Prospector on the golden road of knowledge caring a sack of education is now a beautiful focal point in the computer lab,” said Hall. The stark white walls of Room 120 were transformed into bright and colorful artistry.